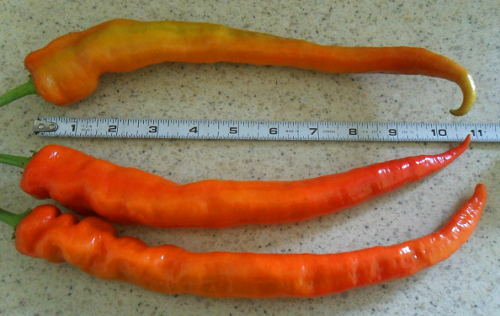 This is a beautiful sweet pepper with long narrow fruits up to a foot (30cm) long. The fruits turn from green to yellow to orange and finally to red and can be eaten at any stage. Originally from Turkey, it is known for its heavy yields, producing as many as 100 fruits per plant according as some have claimed. Local SeedZoo contributor Sofie Bigham says that she never gets that many fruits per plant but for her this pepper has been a reliable heavy yielder in her Ontario garden ever since she began growing it in 1998. Although Corbaci peppers are still grown by farmers in Turkey today, this Canadianized version is a little thicker and heavier than the Turkish original.